You can’t buy time but you can buy the new I.N.O.X Carbon and that’s the second best thing apart of the latest edition to the Victorinox timepiece family. The I.N.O.X Carbon is the new “must have” watch of the season, and for many good reasons to back it up! Entirely made from a carbon resin composite that has protected space shuttles from re-entry temperatures in over 1,260 degrees Celsius. Victorinox is known for its superior dependable functionality and this matte black delivers all that with its cutting edge style. Scratch proof with hyperallergenic properties are a few perks that the I.N.O.X Carbon combines with its super cool style. Its monobloc dial with stamped markers and digits ensures shock resistance. A translucent grey removable bumper provides extra shielding to its case. For the thrill seekers who love a good adventure never fear, the genuine rubber strap will keep the I.N.O.X Carbon in place – its completely budge proof. This fabric was traditionally used for parachute suspension lines and with a breaking strength of 25 kg. So this watch is permanently ready for action 24-7. Buy the I.N.O.X Carbon black dial, black paracord bracelet for $1,500 OR fasten the rubber strap for $1,350. Now available to be purchased! 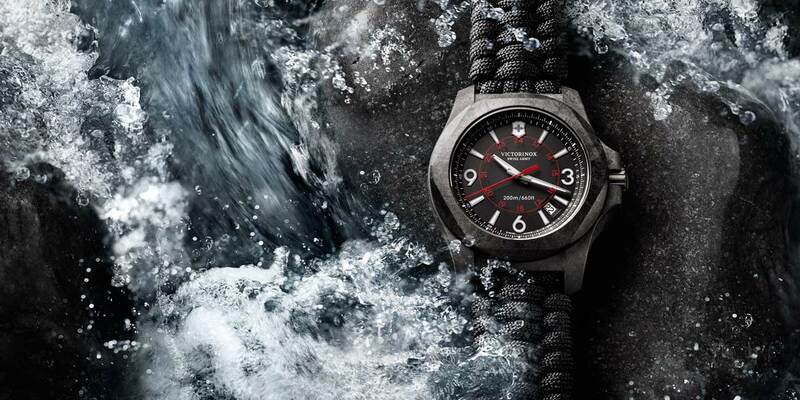 Visit Victorinox online to view its entire collection. Next Next post: Limited Edition iPhone 7 and iPhone 7 Plus RED – Help Fight Aids with Apple!